Born this day in 1881, Pablo Picasso was a 20th century Renaissance man. A cofounder of cubism, a poet and a playwright, Picasso was not afraid to share his thoughts on any topic. 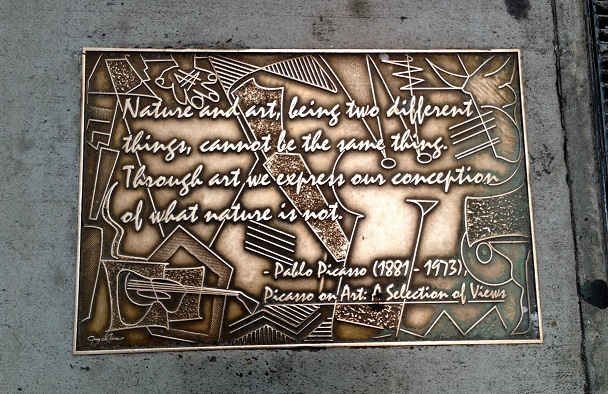 The quote that appears on Library Walk is from a collection of thoughts, Picasso on Art: A Selection of Views. It was published in 1972, the year before his death. cannot be the same thing. of what nature is not. One of the best known art figures of the last century, Pablo Picasso left his indelible fingerprint on public art around the world. His life and work itself influenced other artists and writers, even inspiring a poem by Charles Bane Jr., that the Bar None Group re-published this time last year, Picasso’s Guitar from his 2012 collection of poems, The Chapbook. Whether it be a birth day, anniversary or publication date of a seminal work, the Bar None Group will revisit these 40+ quotations from time to time — quotations that inspire one to write, read, explore and embrace literature. We last visited Alfred Kazin.